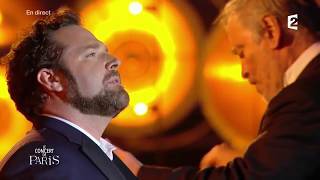 Bryan Hymel continues the summer festival season with a highly anticipated recital debut at the Festival Castell de Peralada in Spain. The American tenor, fresh off the festival stage at Chorégies d’Orange, performs with soprano Irini Kyriakidou and pianist Julius Drake on August 5, 2016. Bryan sings Vaughan Williams’ Four Hymns for Tenor and arias from Mascagni’s Cavalleria rusticana, Gounod’s Roméo et Juliette, and Bizet’s Carmen. With Irini Kyriakidou, Bryan sings “Parle-moi de ma mère” from Carmen. View the full program. As the 2015-16 season comes to an end, Bryan continues the summer with performances across Europe. Sign up for his e-newsletter for updates through next season. Subscribe here.